It’s About Time: 5 Killer New Delays That Will End Your Quest — Distortion Ltd.
An electric guitar without an amplifier isn't a very effective musical instrument. It might look cool, and it's good for noodling quietly on the couch, but it's basically a useless lump of wood in any other context. We tend to think of our guitars as the instruments and the things we plug them into more as tools or auxiliary accessories, but in fact it is the complete rig that is the real, whole instrument. Here at Distortion LTD we are a very pedal-oriented bunch, and as such we regularly extend the title of "instrument" to our stompboxes as well as our guitars and amps. Some might think of them as mere tonal enhancers, but dedicated stompbox jockeys know that when you're plugged into a great distortion or fuzz you play it as much as you play the guitar or amp. Of all the pedals on our boards, though, it is probably the delays that are most deserving of the "instrument" designation. Delay doesn't just alter the signal, it provides a living, breathing copy of it that can move with or against the original in myriad different ways, making one guitar sound like several guitars all playing in a perpetual canon. The way delay effects can enhance or even create rhythms is perhaps their most inspiring facet of their character, allowing a single instrumentalist to play complex, interweaving patterns of notes that would be impossible with an unaffected signal. Delay is more popular now than ever before, in every genre of guitar music, and the category has really blown up recently, evolving along with technologies that allow incredibly powerful tone engines to be packaged in modestly sized boxes. For those of us that are in love with echo, these are heady times indeed. The past year or so has witnessed a number of new, all-encompassing delay powerhouses come our way. Here are a few of our favorites. 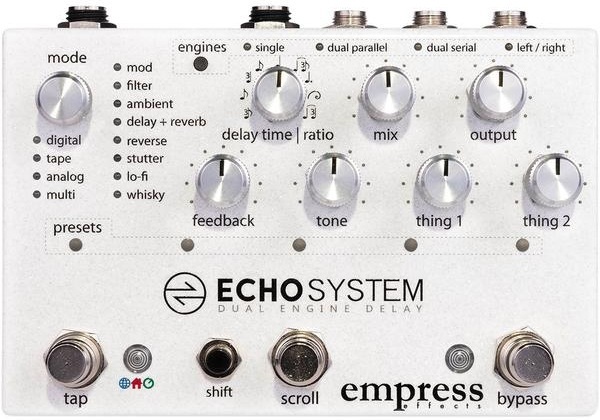 Among the newest entries into the ultimate delay game is the Echosystem, an incredibly, almost preposterously, fully featured echo box from our friends at Empress Effects. There are more delay algorithms that you can shake a Lexicon PCM 42 at (over 36, actually), extensive tap tempo functions, and dual delay engines that let the user engage two delays at once in either series, parallel, or left-right. You can save up to 35 presets and use either bank or scrolling modes to call them up on the fly. Even greater control can be had via the Echosystem's Universal Control Port, which allows for MIDI, audio, control voltage, external tap, and expression connections through its quarter-inch jack. This exhaustive feature set would have been enough for most companies, but Empress also tacked on a cab simulator with three variations, transformer-isolated outputs for quiet and effortless stereo setup, and a bunch of other things we just don't have time or space to get into. Trust me when I tell you that the Empress Effects Echosystem is a game-changer. Check it out! Digital rack effects have often been regarded with outright derision (or at the very least, deep suspicion) by a lot of guitarists, but these days more of us are developing an appreciation for these powerful and unique sounding units. The design team at Meris has taken particular inspiration from the way players like Frank Zappa used—and often abused—classic digital rack delays, pushing them to their limits and cascading them with other units to create new tones. This inspiration led to the creation of Meris's Polymoon. The unabashedly digital Polymoon combines pristine multi-tap delays lines with all manners of modulation, pitch shifting, and filtering to emulate the sound of the cascaded rack effects of yore. With tempo-syncable phasers and dynamic flangers onboard as well as extensive smearing and filtering options, it is capable of some genuinely unprecedented modulated delay sounds. A full complement of MIDI and expression control options further extends the capabilities of this entrancing delay. If you want the rack tones without the rack, the Meris Polymoon has got you covered. While digital delay technology continues pushing the ever-expanding boundaries of the effects multiverse, some of the most interesting breakthroughs continue to happen in the (digitally controlled) analog world. Fully featured analog delays like the Limbo III from Dunedin, New Zealand's 80Tape illustrate this dichotomy. The Limbo III is based on the MN3005 and MN3007 analog BBDs that contributed to the warm, lush tones of pedals like the Boss DM-2 and Electro-Harmonix Memory Man, and it both adheres to and greatly expands upon these legacies in very intriguing ways. With tap tempo, 1100 milliseconds of possible delay time, multi-tap options, extensive expression control of delay and modulation parameters, gain control, and subdivisions, the Limbo III seems to be taking analog delay about as far as it can possibly be taken. Its modulation options get a lot of attention, in particular its arpeggio mode, which is unquestionably pretty damn far out. I don't think I've heard another delay that makes these kinds of noises in this way, and I hear a lot of delays. 80Tape is definitely onto something. Mention the words "Chase Bliss Tonal Recall" around delay nerds and it won't be long before you hear things like, "greatest delay pedal ever made," and "mine is never leaving my board." The original Tonal Recall clearly has quite the reputation, but Chase Bliss really sent it over the moon earlier this year when it released the Red Knob version of the pedal, which doubles the number of reissue MN3005 chips used from two to four. This upgrade increases maximum delay capability to 1100 milliseconds, while also improving the overall clarity and definition of the pedal's repeats, as well as the musicality of its oscillations. 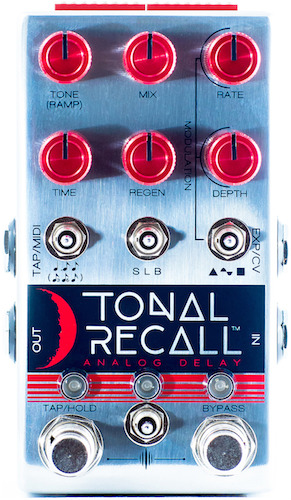 And of course the Tonal Recall Red Knob continues in the tradition of the best analog delays of the past, while pushing forward with a mind bending array of digital control options, from tap tempo and expression control, to true bypass-or-trails options, and even the ability to save presets. Unlike many comprehensively featured echo boxes, the Chase Bliss Tonal Recall is also very compact. DOD has come out of retirement stronger than it ever was before, and each new pedal release seems to be more impressive than the last. The Rubberneck Analog Delay, released last year, offers more hard evidence of this positive trend. The Rubberneck coaxes 1500 milliseconds of delay from its analog bucket brigade heart, which is quite a feat in itself, but DOD didn't stop there. It also features tap tempo with subdivisions, and the tap switch functions as an automatic oscillation switch when pressed and held. The Rubberneck mode is another amazing feature, which ramps delay time up or down when the bypass switch is held down. It has switchable tails, Gain and Tone controls for extra grit and murk, as well as Rate and Depth controls for modulation tweaking. The Rubberneck works beautifully with DigiTech's FSX3 footswitch, and it even has an effects loop on the rear for mangling and warping your repeats with external effects. At a street price of under 250 bucks, the Rubberneck is an enormously attractive option in the powerhouse delay market.